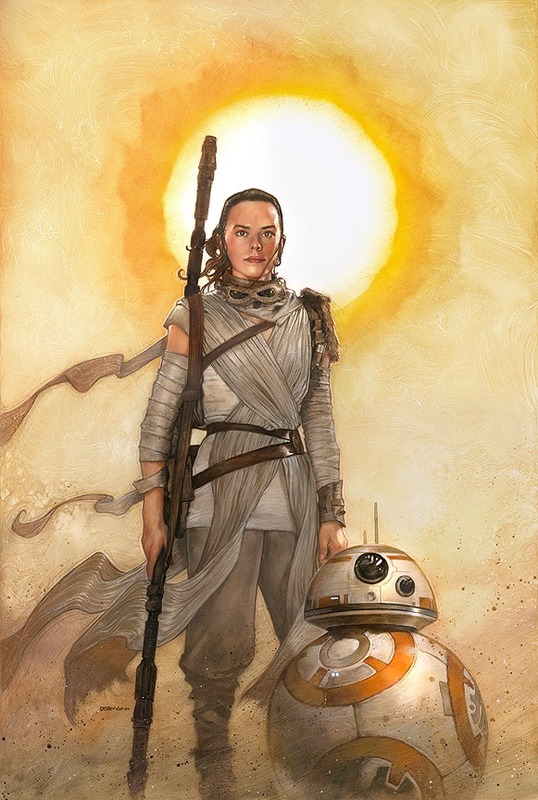 Dave Dorman did a cool personal painting of Rey and BB-8. The release date for Aftermath: Empire’s End has been slightly adjust. It will now be coming out on February 21, 2017 (moved from January 21st). Edelweiss has some new entries and updates. Unique approach: A unique, taxonomical approach to Star Wars, with five chapters: geography, science & technology, history, culture and nature. Objects are arranged according to increasingly narrowing categories, e.g. Culture » Fashion » Helmets. Visual: Carefully curated images that allow the reader to explore the Star Wars story picture by picture and special feature boxes and sidebars will pull out items in more detail, display movie action shots and delve into cross-sections. Celebrate Star Wars with a box set that you’ll need to be Force strong to lift! Enjoy adaptations of every film in the series so far, plus a special prelude to Episode VII-The Force Awakens. Follow Luke Skywalker and the Rebels into all new adventures with the first collection of Marvel’s best-selling new Star Wars series, and turn to the Dark Side with Darth Vader’s own debut volume! Then savor a stunning gallery of Star Wars covers by Marvel’s greatest artists. It’s the ultimate celebration of cinema’s greatest sci-fi epic in comic book form! Darth Vader #20, #21, #22 and #23 are getting second printings in September with new covers. Bleeding Cool has the lowdown. Comics Continuum has a preview of The Force Awakens #3 adaptation. Star Wars Reads returns this October, but now it will be for the whole month. StarWars.com has the announcement. MidAmeriCon II is August 17 to 21 in Kansas City, MO. Star Wars guests include authors Kevin J. Anderson, William Dietz, Alan Dean Foster, Rebecca Moesta, Martha Wells (click here for her schedule) and Walter Jon Williams (click here for his schedule). Wizard World Chicago is August 17 to 21 in Rosemont, IL. Star Wars guests include Carrie Fisher, Daniel Logan, James Marsters, Ray Park, authors Adam Bray and Greg Weisman, comic writer Charles Soule, and artists Katie Cook, Joe Corroney, Dave Dorman, Michael Golden, Salvador Larroca, Joe Quinones, Livio Ramondelli. The latest episode of The Star Wars After Show. In addition to the normal episode of The Star Wars Show, they also have an extended hour long interview with Dave Filoni. The Rogue One international trailer is out now. EW has some Rogue One interviews with Forest Whitaker and Felicity Jones. In other movie news, the trailer for Arrival looks pretty good. It’ll be out in November. Also coming out in November is Allied which looks like a solid WWII action/spy flick. From 4-LOM to Zuckuss.com has a first look at Hasbro’s U-Wing Fighter. HK-47…er…HK-55 is coming to Star Wars: The Old Republic as a playable character and with a droid companion.